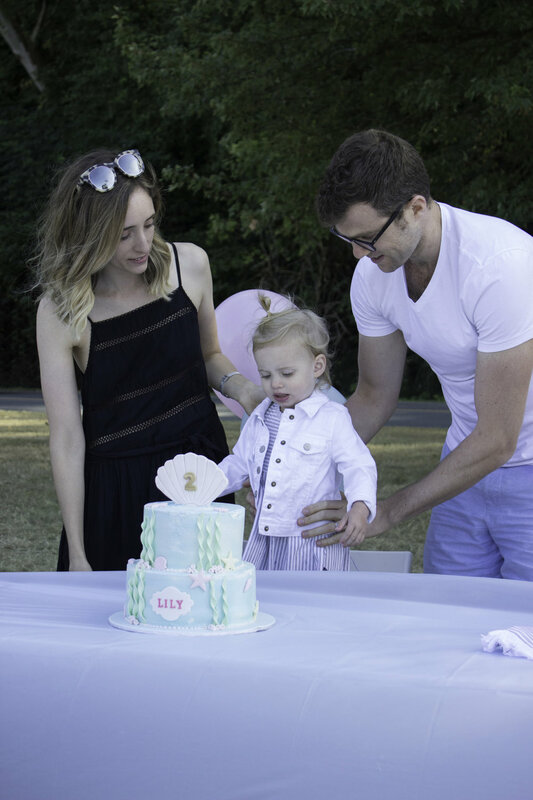 I'm excited to share with you some snaps of Lily's 2nd birthday party. We had such a beautiful day celebrating our little lady turning two. Although the party only lasted for a few hours it was full of toddler giggles (hello cake & water play area), as well as meltdowns (the tragedy of a balloon flying off into the sky, RIP). Organising an outdoor kids birthday party is no easy feat, so I wanted to share some of my learnings from this exhilarating yet exhausting day. As Lily is super into anything beach, mermaid, sea creature related things right now, I chose the theme 'under the sea' (pastel edition). Let's be serious, this will probably be the last year I can pick a theme before Lily turns it into 'Frozen' every single year haha. I gained a great amount of inspo from Pinterest (see my board) and also from The Cross Decor & Design. Location, location, location. It's everything! As Lily is born in the (Northern hemisphere) Summer she will most likely have a birthday outdoors every single year. I mean, how can you stay indoors on a beautiful BC blue sky day? Naturally we chose to have the party at a grassy area of Spanish Banks beach. Here's a little nugget of wisdom, send a pin with your location an hour or so before the event for less confusion. The beach we chose was super long and had three carparks only differentiated by east, central and west.. so confusing! Everyone made it before the cake cutting but it added some additional stress that my phone was ringing off the hook, with my poor directions not helping anyone! Lesson learnt. Now to decide on timing of the party and whether to have it in the morning, lunch-time, afternoon or early evening? Knowing it was a beach party, afternoons were going to be warmer than an a morning party, but I also made it suit Lily's nap schedule and held it from 3-5pm. Most of her friends are down to one nap a day, so the schedule worked for most. Remember that the timing won't suit everyone but stay firm and do what works best for your kid.. it's their birthday after all! If family or friends ask to help, take them up on it. I don't know why I tend to start these party ideas with an 'I got this, I can do it all' mentality when really, there's no harm is asking for help. Av cooked all the food, my amazing parents went ahead and set-up the area while Lily was finishing her nap, Randa took most of these amazing shots & our extended family picked up balloons. It takes a village! I knew long before setting a time & place for the party that I wanted to get a professional cake as 1. I didn't need the extra stress of mastering a cake the day before the party 2. I was never going to do as good a job as Cupcakes did! Hehe. I worked with the Cupcakes team to create this custom cake (yes they do more than just cupcakes!). Their location on Thurlow & Robson street is super convenient and right near Aritzia (duh.. so I could pop in and get this dress!). They sent back some inspo images and we agreed on the general look, colour palette, flavour, filling etc. I'm really happy with how the cake turned out and it was absolutely delicious. Lily was obsessed with all those little frosted starfishes & shells. Because the party was set between 3pm to 5pm it was in-between lunch & dinner (genius move I know) so we put on some light tapas, salads, cut fruit and veggies. These were pretty straight forward and easy to make and didn't take up the entire morning to create. As you're not supposed to drink on Vancouver's beaches, we keep things low-key with Grapefruit & Lemonade sparkling water as well as small water bottles for the kids. As much as you may want the party to be Pinterest perfect, you've got to remember that there has to be an element of fun for the kids. As it was a beautifully sunny day, we set up a blow-up pool (cheap one from the dollar store) and added a bunch of ocean themed toys. The mini-pool was a big hit! So many of the kids just hung out there all day. 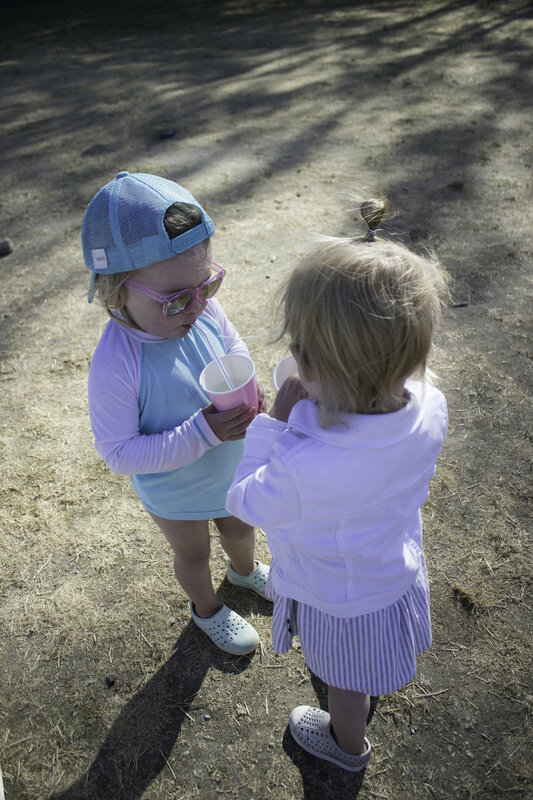 Pro-tip: bring an additional bucket of water for kids to dip their feet in after running on the grass. It saves your mini-pool turning into a swamp! Instead of putting together a candy goodie bag for each kid that attended, I went and bought some cute little beanie boo's toys, in under-the-sea theme of course. It was so sweet seeing all of Lily's friends loving their new toys and texting me later that week that they are still obsessed with them. That being said, it took a lot of convincing to get Lily to understand all the toys weren't hers haha.